Did you know that we have a large showroom in the center of Aarhus Denmark? All the many different clic models and colours are on display in the showroom and we are ready to help you with your specific need and guide you towards to best solution for you. All you have to do is contact us to make an appointment – just to make sure we are here and available when you get here. You can find our contact information right here. Do you know how many cable holes you need? But maybe your need is different from our standard solution. Maybe you need more cable holes – or non at all? It’s important to think your choice of holes carefully through before you order a furniture. Do yourself a favour and read about all the possibilities RIGHT HERE. 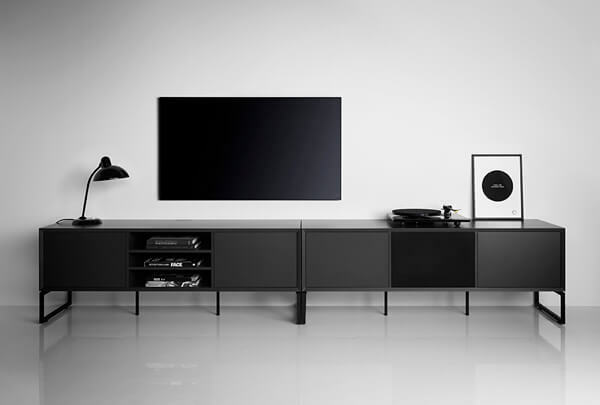 Are you looking for a cool way to store your favourite vinyls? 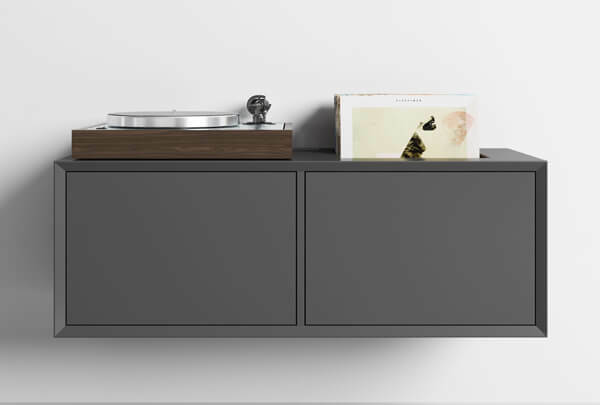 Many of our models can be ordered with a Vinyl hole in the top of the furniture. 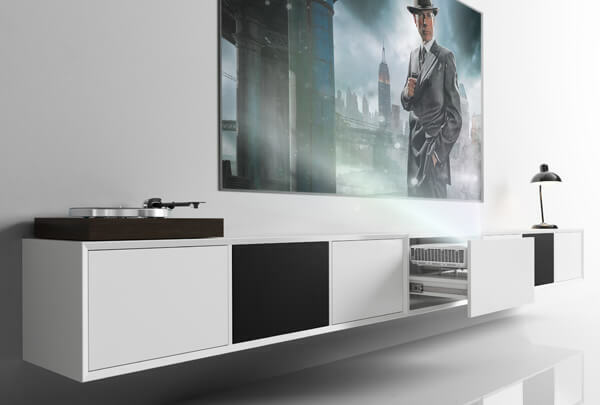 It makes it easy for you to flip through your favourite vinyls. 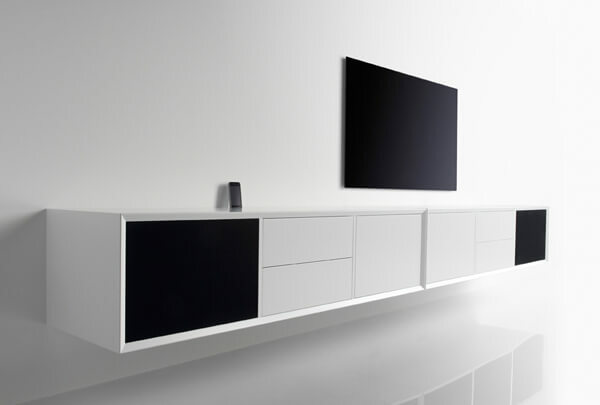 Do you want the big movie and sport events in your livingroom? 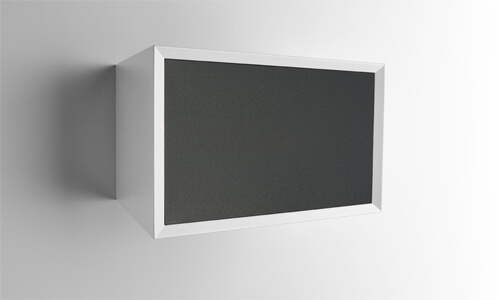 The projector drawer is designed to store a short throw projector which gives you a 100″ picture from a short distance. 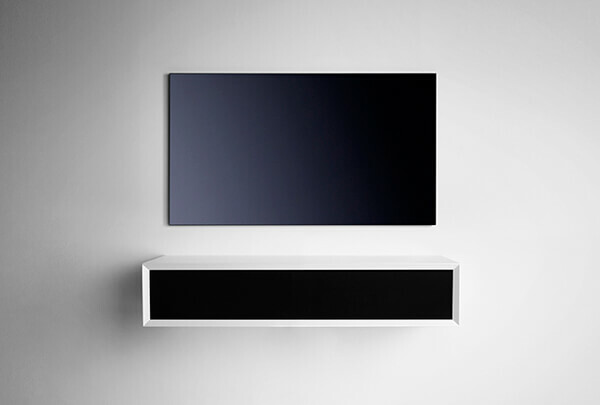 A single and elegant solution – only visible when you want it to be. The new projector drawer will fit in the 2 new models 210 Large and 310 Large. Want to learn more? Just click RIGHT HERE. You can now choose all 4 clic cable cover plates in a cool brass finish. 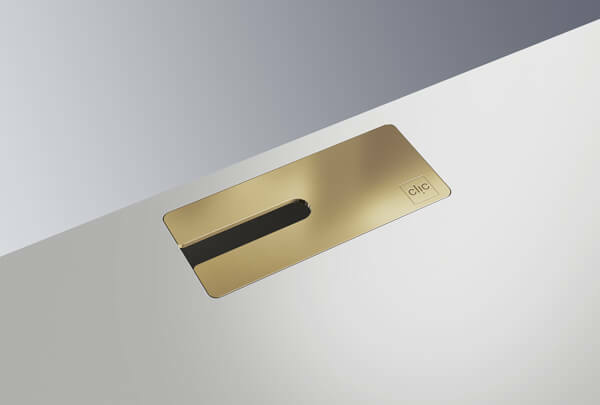 The brass cable cover plates creates a beautiful contrast to all the 4 colours available in the clic furniture range. See all the 4 variants right here. Before summer we promised to reveal more new products..
Say hello to our brand new model 230S and brand new limited green color. 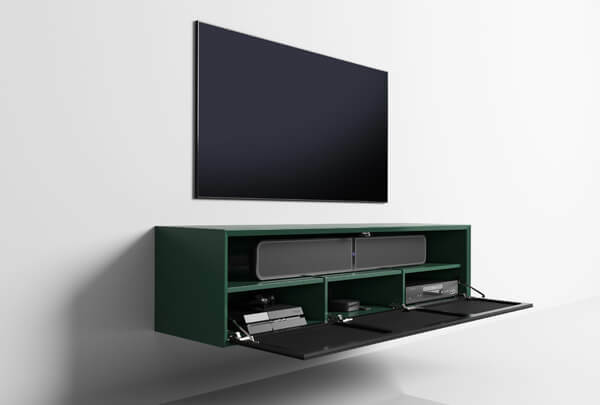 Model 230S has the advantage that you can store a Soundbar on the top shelf and individual products in the 3 bottom rooms. The model has one big door that opens downwards and it is off curse completely up to you what you wish to store inside the furniture. Model 230S in 37,5 cm depth will also be available as model 231S and 232S in depth 45,5 and 55 cm. All S-models will be available in limited green. The new products will be available from September and will be in our new pricelist and on our website in September. When we kick in the new season after summer it will be with several clic news. One of them will be a new light grey colour available on all clic models. Here you see a clic model 230 in light grey with 3 black fabric doors. We look forward to reveal more news in August. 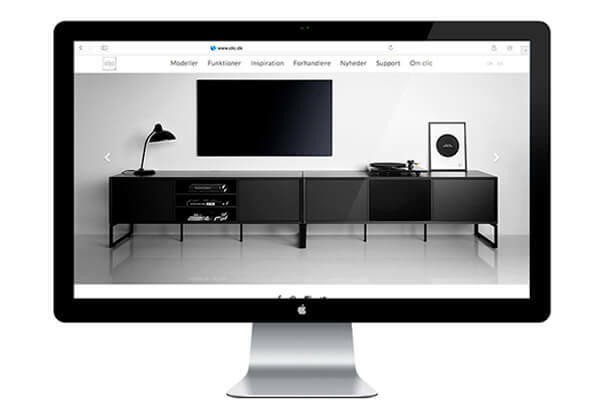 The new and responsive website provides and easy way to find all the information you are looking for – from a computer, tablet or a smartphone. With the new website we also introduce a long line of news in the clic range. New models, a brand new color, a fireplace solution, new accessories and a new inspiration page. You can read more about the news on this page or you can discover them under Models and Functions in our top menu. If you have any questions about our products, please go to Support and contact us. On the photo above is the new model 120S. To read more please go to Models in the top menu. Grey - the new black ! The grey color offers a reclined and simple expression in your home. It is forever current and provides a beautiful and elegant base in your decor. 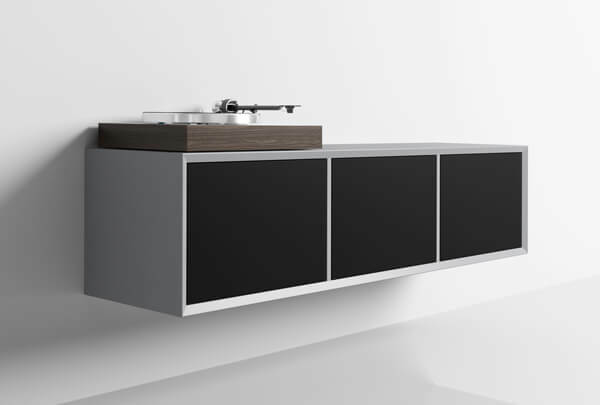 All clic models, wood doors and drawers are available in the new grey color. 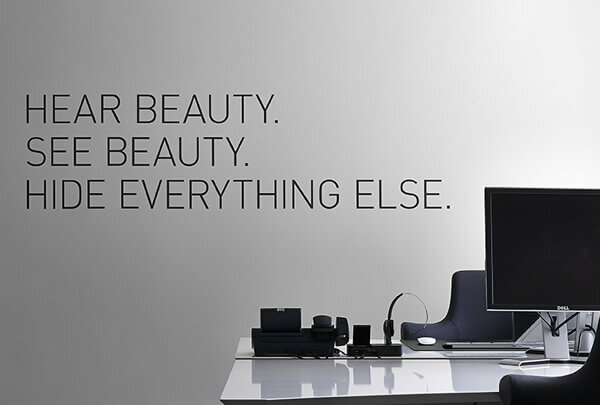 Model Desktop is a combined furniture/work station. clic Desktop has the same functions as the other clic models. Desktop has one desk flap that opens downwards. When the flap is down the top of the flap is aligned with the furniture. 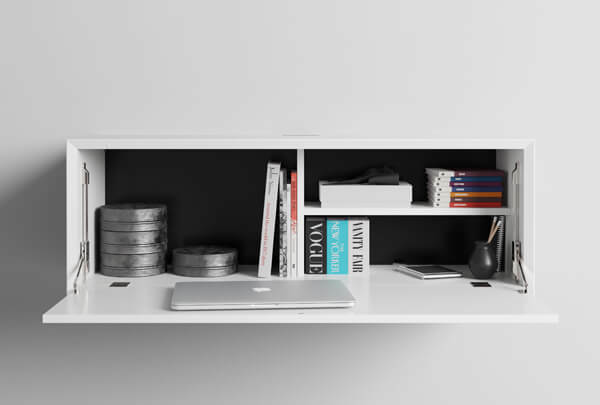 Desktop is fitted with two shelves and two backpanels behind the flap. The idea with the Desktop model is to use it alone or to integrate it with other clic models. When the flap is closed, model Desktop looks just like any other clic model. Integrate the warm and cozy feeling from a bioethanol fireplace into your living room - directly placed in the top of a clic furniture. With a clic fireplace you can integrate the warm and cosy feeling in the top of your clic furniture. 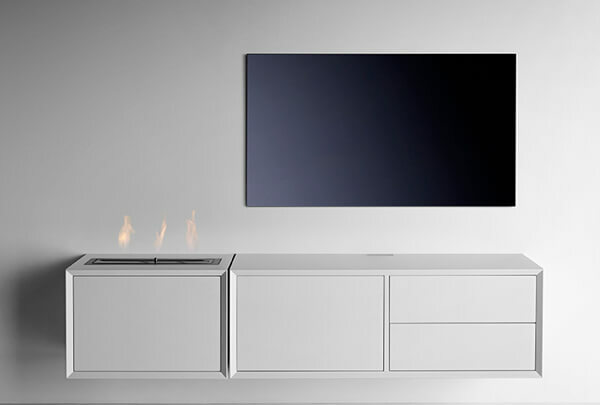 The bioethanol fireplace piece can be purchased for most clic models. If you choose a clic model with several rooms, you simply choose above what room you wish to fit in the fireplace. The glas plate in front of the flames is mounted with magnets and can easily be taken of. Read more – go to Functions / Fireplace. The new black cable cover plates are like the silver ones, produced in aluminum. The black cable cover plates are anodized black and are like the silver, available in 4 different variants. Read more – go to Functions / cable cover plates. With a clic charger it is possible to place and charge your iPhone directly in the top of the furniture. 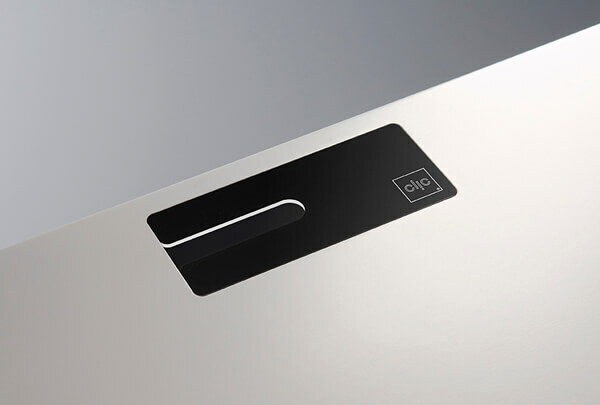 The clic charger consist of a special produced plastic block that will be attached to a aluminum cover in the furniture. 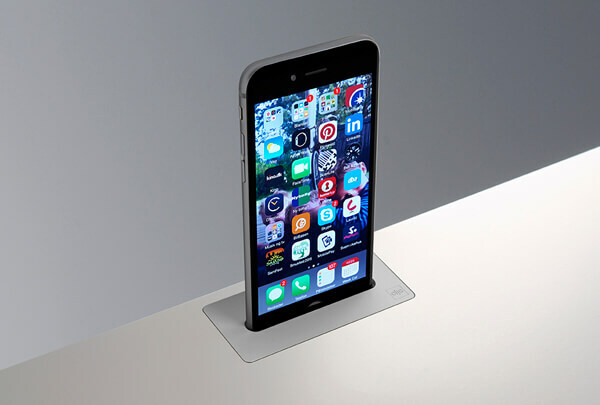 The charger is tightened to the furniture so it is easy to place or remove your iPhone. The aluminum cover in the charger has a special carving to fit the different items. They are made so the item is supported on the back. 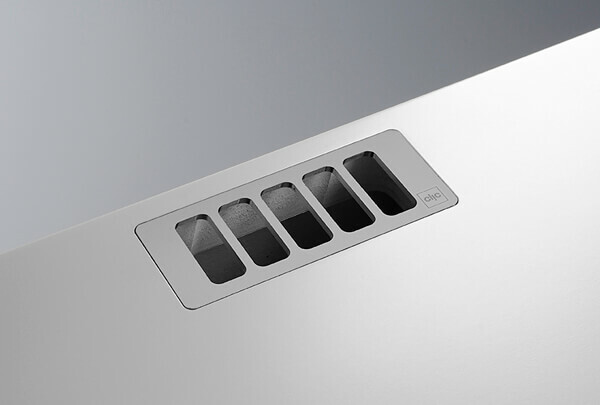 If you have products inside your clic furniture that get really warm, you can use our ventilation solution. With a clic ventilation you can cool down the items you have placed in your clic furniture, usually behind a wood or a fabric door. The ventilation is mounted under the cable hole in the top of the furniture. The ventilation fits in most clic models. You can order the ventilation solution now – delivery from January 2016. Read more – go to Functions / Ventilation. 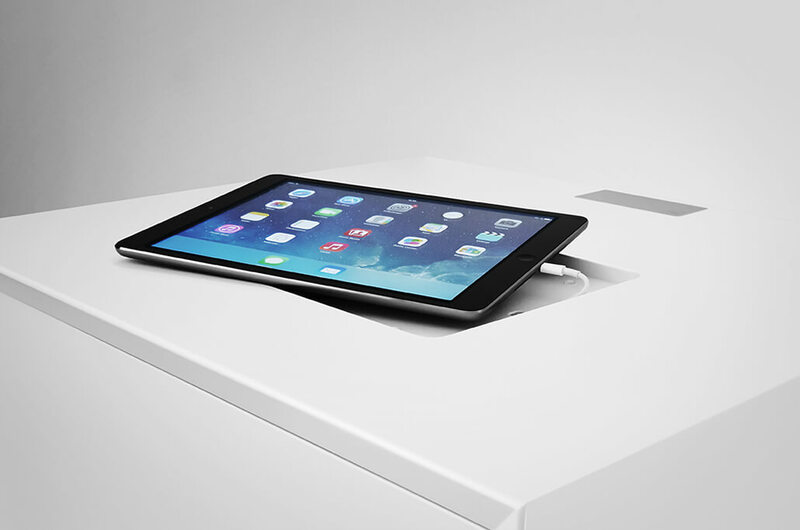 With a clic iPad Pond it is possible to integrate your iPad in the top of a clic furniture. The iPad will be aligned with the top of the furniture. With the help of 4 rubber buttons at the bottom of the Pond it is easy to tilt up the iPad when you want to bring it with you. The lightning cable runs in a track underneath the Pond and is complete hidden. clic iPad pond fits iPad air and air 2. And also iPad mini, mini 2 and mini 3. All with and without Retina screen. 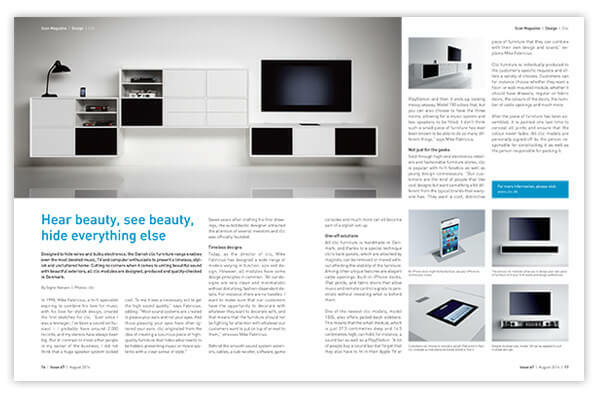 There is focus on design in this months issue of Scan Magazine. Scan Magazine wanted to do an article on clic. Read the article in Scan Magazine by clicking on this line. WE ARE HAPPY TO INTRODUCE 8 NEW COLORS IN OUR FABRIC DOOR RANGE. With 11 colors in total we have even more combination options. When choosing fabric doors you can sit in your sofa and operate your system with the remote control, while music is playing through the fabric doors.